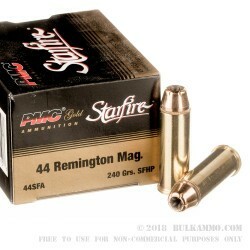 PMC’s answer to the personal defense load for the .44Remington Magnum, this is a sufficient round for any personal defense situation you can throw at it. 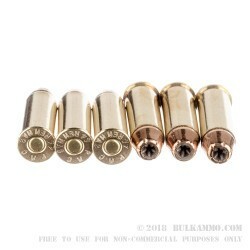 The load is a hard hitting 240 grain jacketed hollow point with a star shaped divot in the projectile which helps it to expand reliably and with a larger diameter upon expansion. 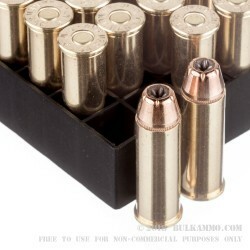 The heavy powder charge and the quality brass case and Boxer primer round out a very high quality self-defense option. 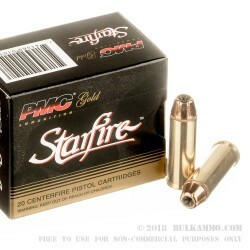 Offering 1340 feet per second and 957 pound feet of energy from the muzzle, this is a high velocity, high energy .44 magnum, that’s quite potent before you factor into the mix, the Starfire engineered bullet. PMC is the Poongsan corporation, a company started in the late 1960’s in South Korea, that has been producing top quality product since its inception. They have a very nice foothold in the American shooting market because of their excellent reliability historically, and their extremely competitive prices. No longer are they seen strictly as an “import” round. The shooters in America have essentially adopted the brand name as one of their own. The consistency and reliability as well as the accuracy is every bit as good as comparable top end competitors stateside. This round is no exception to that idea. Using a 7.5" Ruger Redhawk topped with a vintage Bausch & Lomb 2x scope (my eyes aren't a good as they used to be), I dropped a 214 pound boar at 110 yards. I waited until he gave me a broadside shot and the Starfire dropped him where he stood. No second safety shot required by the time my old legs got me there. Very pleased with these rounds extremely hard hitting at 100+ yds.